Evelyn was trying on some new spring clothes this morning (after all, it is 51˚ outside). 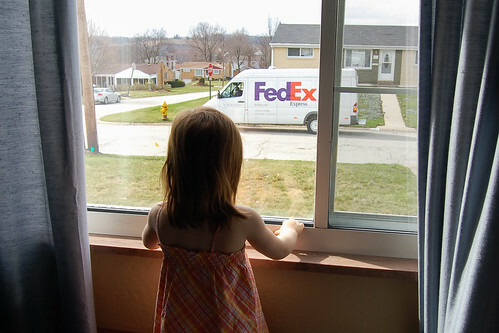 She only got through one dress when she was distracted by the arrival of a FedEx van across the street. She was excited when the driver dropped a package off at our house, even though he didn't stay to chat. 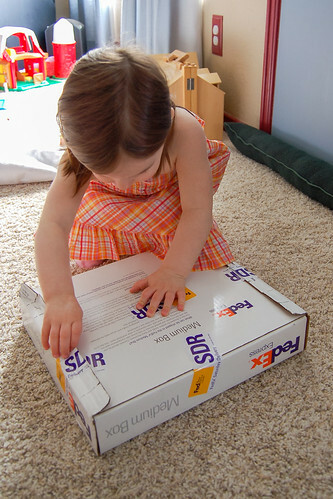 It took her a few minutes, but Evy finally got the box open and revealed its contents. Contents so important that they had to be priority delivered on a Saturday. 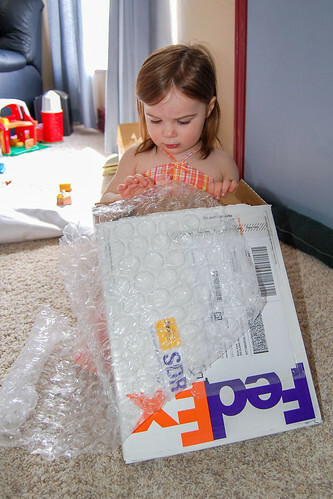 She still doesn't know what was in the box - other than 45 minutes worth of bubble wrap. I want to pop some, too! You never told us what was in the box besides the bubble wrap! Your arms look so long when they are not in a long sleeved shirt. Keep your warm clothes handy. It's still not too warm outside. And save some pops for me! Grandma C.